Last week the ordinary stuttered into extraordinary: our first lamb was born. My eldest son Eli delivered the news in a phone call to me when he went to the barn to close up the animals. “Mom, I think there’s someone here you’ll want to meet,” he simply said, without offering more. My first thought was one of my father’s old friends had stopped by looking for him, having seen the glow of light on in the barn, since for decades my father could always be found at this time of night milking our cows. But I was wrong. I was surprised how long it took me to even consider the alternative: Juliette, our rare Leicester Longwool sheep had given birth to her long-awaited lamb. I had days before started a blog post I hadn’t yet finished entitled, “(STILL) Waiting on the Damn Lamb.” I had done preliminary research on buying a “lamb-cam,” since the word lamb irresistibly lends itself to word play of all sorts. “Lam(b)enting the wait for a lamb is a lamb-able offense,” I had written to no one in particular, as I failed to hit the publish button on that blog post for good reason. But the truth is, I was a combination of annoyed and worried by what seemed like the longest pregnancy on record for a sheep. Wasn’t there something I should be doing? Aren’t we always waiting on some proverbial lamb? 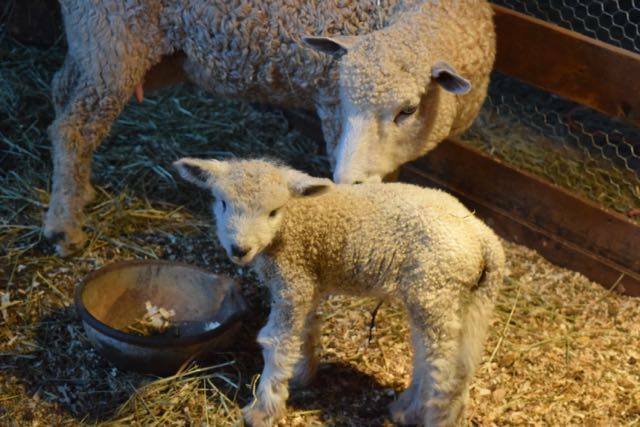 When I got to the barn that night, Eli was standing quietly by a tiny wet, white lamb and her mother. A separate peace had descended on the pen. Something about the scene made both Eli and I whisper to each other a mixture of instructions and excitement. All of a sudden there was so much to do; and yet there was nothing at all needed. The sense of peace in the barn stood thick like a protective fog, while we toggled back and forth between it and our desire to play a part. For months I had procured information about lambing and tools were safely stashed in a chest we called our “lambing kit.” But now there stood a perfectly healthy lamb, still wet and rooting her mother’s under carriage to latch on. The lamb would occasionally lose balance. Or her knees would buckle to the ground. But she’d build her way back to firm purchase, discovering each nob of her legs unfurled like a jointed ruler. Yes, this was a certain kind of peace, I thought, as I watched Lulu nurse. After all the waiting and preparation, the real surprise was to find such deep peace in not being needed at all. Congratulations! Just in time for Mother’s Day. How lovely. Love this so much. Congratulations!!! beautiful! and yes, happy mother’s day!